The federal REAL ID Act of 2005 sets new standards for the issuance of driver licenses and identification cards. The REAL ID Act became effective nationwide on May 11, 2008. Florida began issuing REAL ID compliant credentials after January 1, 2010. The new credentials have a star in the upper right corner of the card, as shown in the sample license example on the right. 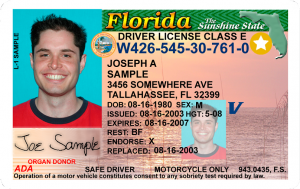 Florida is a REAL ID compliant state and all Florida licenses should be accepted nationwide. The Department of Homeland Security announced on December 20, 2013, that enforcement of REAL ID credentials will begin in a measured, fair and responsible way. Floridians will first see enforcement at nuclear power plants and restricted areas of certain federal facilities. Enforcement at airports across the country will not begin until October 1, 2020. The chart below summarizes the four phases of enforcement. Phase 3 Semi-restricted areas (i.e., areas available to the general public but subject to ID-based access control) for most Federal facilities. For additional information regarding the REAL ID Act or its enforcement please visit the Department of Homeland Security. Does Florida issue REAL ID licenses and ID cards? Yes, Florida began issuing REAL ID licenses and ID cards on January 4, 2010. Will I be able to have both a REAL ID driver license and a REAL ID identification card? No, the final Rule specifies that each individual can only hold a REAL ID driver license or a REAL ID identification card, but not both simultaneously. If you currently hold both, one will be cancelled during your next card issuance. 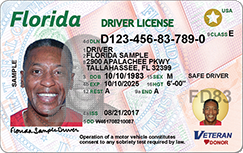 After Florida begins issuing REAL ID licenses and ID cards, can I get mine before the expiration date on my current license or ID card? Yes, a Class E license can be renewed up to 18 months prior to the card’s expiration date.